When faced with tragedy some people have the strength to rise above and make the most out of it. That's what Kristi Warriner and Justin Nelson decided to do. Kristi became pregnant with twins, she and Justin named Colt and J.J. On Sept. 2, 2014 she delivered Colt still born. The couple was devasted, but there was little time for grieving. 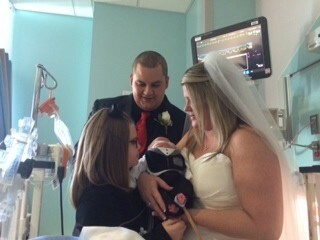 J.J. was immediately taken to Cook Children's NICU. "I wanted the best for J.J. and I knew he would get it at Cook Children's," said Justin. Once J.J. was in good condition and appeared to be on the road to recovery, family members kept asking what are you waiting for, why not get married now. So Kristi, Justin and our NICU nurses went to work making the arrangement safe for baby J.J.
Kristi picked 11,11, 2014 because she says it's a lucky day and now she is blessed with a preemie who is doing great, a wonderful husband and her adorable daughter Carissa. Read more and watch the video from the Star Telegram by clicking on the links below. Should the unexpected happen, you want to choose the right NICU for your baby. Preemies, critically ill and medically fragile babies need the very best care available. Cook Children's Neonatal Intensive Care Unit (NICU) provides state-of-the-art care like few NICUs in the state of Texas and beyond.